Maintaining the look of your home has never been easier than when you seek deck cleaning and staining services from our team in Des Moines and Ames, Iowa. Backed by more than 20 years of experience, Day Star Window Cleaning Services LLC understands that your home is your sanctuary. For that reason alone, we are committed to ensuring that your home looks its best all year round by not only offering you impeccable cleaning services for your outdoor space. We also provide you with the education and maintenance plans to keep up with your space after we are gone. We also stain furniture upon request. Using only the most user-friendly products and professional methods, we work diligently to restore your deck, fence, or gazebo back to its original condition. Before our arrival, we request that you remove all of your deck furniture, unless it is to be stained. When working on your deck, we take the time to exfoliate and sand your deck properly to remove all mill sap, dirt of grime from the wood. This makes it possible for us to apply an even and beautiful coat of wood stain, as well as enable the stain to take to the surface optimally. Afterwards, we pressure wash your deck and wait until it is dry to prepare the area for staining with light sanding and taping off certain parts of your deck. We also offer pressure washing services only if you want to apply the stain yourself. Once we have completed the job, we guide you through our maintenance schedule as well as the products we used for future reference. For our deck services, we require half of our payment after we pressure washed your surface and the balance after we have finished staining. During our on-site consultation with you, we measure and determine the size of your surface, including railing, steps, lattices, and posts, in order to give you the most accurate price based on square footage. In having the proper square footage, we are also able to ensure that we have the proper amount of product for the job and know the timeframe for completion. The minimum price for this service is $250.00. 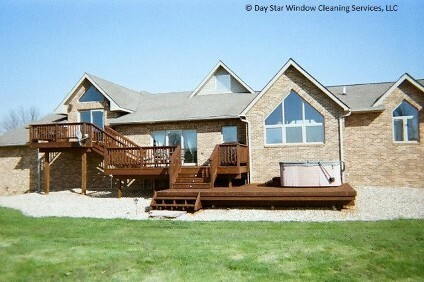 Half payment will be received after pressure washing, then the other half after the staining. Process: We clean the deck first by exfoliating (a combination of pressure washing and an effective deck cleaner not one with out the other); this then helps to remove mill sap from the wood, which then allows the wood to receive the stain. After Day Star does the proper pressure cleaning, we direct our customers to the appropriate color choice stain fitted for their deck or fence. We will let the wood dry and complete the prep of the deck, which may involve a light sanding. (If the customer does not properly clean the deck it is not guaranteed that the wood will accept the stain) We request that if we are to stain your deck the you MUST have Day Star pressure wash the deck to insure it is properly cleaned. 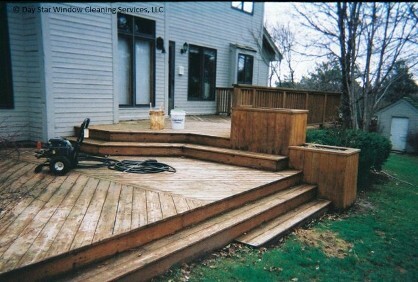 The customer may also have us pressure wash their deck and stain it themselves as well. Our prices are based on square footage of the decking (floor) and this is measured by number size (of wood)= square footage. To get an accurate square footage of the entire deck or fence it is important to include railing, steps, lattice, posts, ect. By having the accurate square footage we will know the proper amount of product or stain, as well as how much time will be spent on a particular job. Before we arrive we ask that you please remove any deck furniture unless it is to be stained. Unlike most window cleaning and house pressure washing jobs that can be booked over the phone DSW feels It is best for the customer that the deck, fence, and gazebos, ect jobs are bid on site unless otherwise requested (a general bid over the phone). Minimum price of pressure washing and staining is $250. Depend on us your Wolman Certified Contractor to restore and protect your exterior wood! 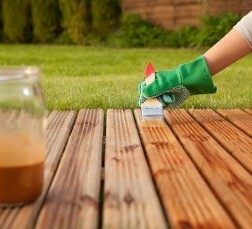 Request an estimate to ensure your house looks perfectly inviting with our deck cleaning and staining services.